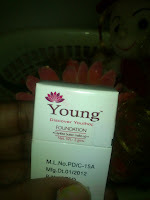 Today I am going to Review Young Discover Youthopia Foundation Clarified Butter Make-Up-1D. 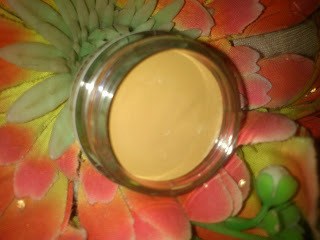 I have just received this Foundation yesterday from Urban Touch Online Shopping. I have tried so many Foundations for my Oily skin. 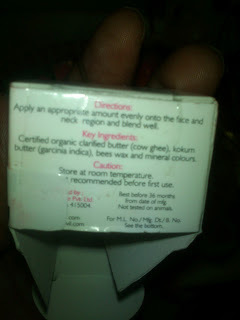 So, this time I havr selected this Foundation as It is made up of Natural Ingredients. 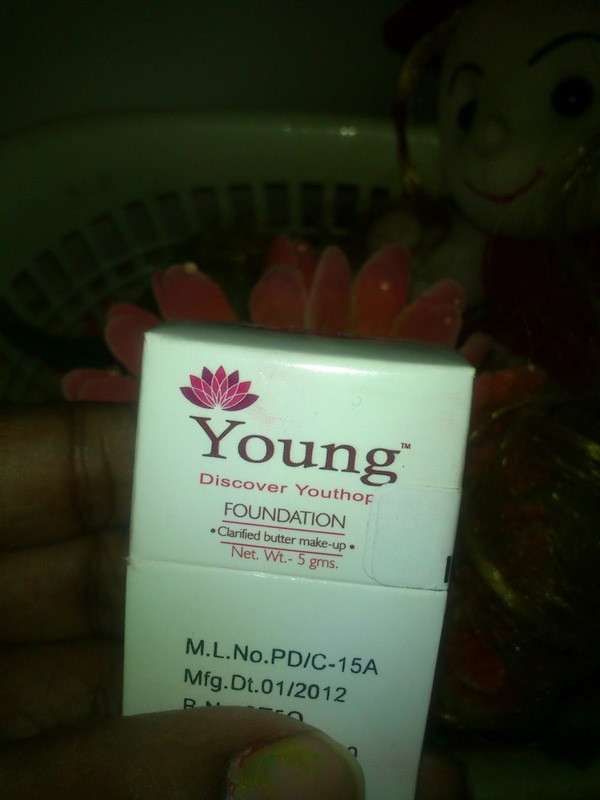 This Foundation has something different Name 'Young Discover Youthopia" . Also I have applied on my face yesterday night itself to test whether it will suits for my skin or not. Certified Organic Clarified Butter (Cow Ghee) And Kokum Butter (Garcinia Indica) rejunevate Your Skin, as pure mineral Colors blend with your Skin for a Lustrous Luminous Complexion to give you That Flawless Look. I was waiting to apply and test this Discover Youthopia Foundation Clarified Butter Make-Up-1D. So, after settling every things I took this Foundation 1st and did a patch test on my ear side. 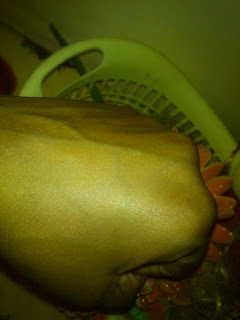 After One hour i didn't notice any Irritation or itching Etc. So, with full confident I have applied it on my Face. I have to tell about the size of the pack. Yes, It is so tiny smaller than a Lip Balm pack lols. because It is just 5 gm na... You can see in the picture How small it is. Very easy to put this Foundation in my Purse. The Smell!!! Wow, I just love the smell of this Foundation. It is like a very sweet smell can't explain just. I am always fond of sweet smell. The Texture of the foundation is little hard, that didn't easily melt in hot condition. 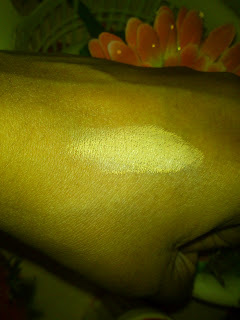 The shade is very neutral I think, It just matched with my dusky skin. You can see the Texture of the Discover Youthopia Foundation Clarified Butter Make-Up-1D and how it is blends in my hand. It gave immediate glow to the Face. Working well with my Oily Skin. Blends Easily and looks very natural. 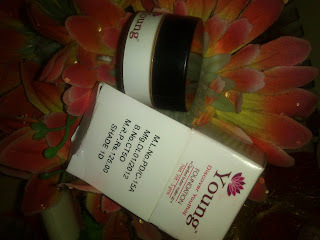 I think no need of Moisture before apply this Foundation, because It gives enough moisture and matte finish both. Have to cover with Compact Powder, otherwise Oily skin people may feel too much shine on their face if they are in hot and sweat condition. If you are in a airconditioned room it will give amazing fresh look, I am sure. Suits even for Oily skin, I think it will work well with all skin Type. Though the pack is travel friendly taking the cream from the tub is little difficult, like digging inside the tub always to take the cream. Hey I too have combination skin which tends to be oily after some time of applying makeup. I have to use primer for my makeup to look fresh and stay put. I should try this foundation to see how it works since I dont trust the effect of primer on my skin. Thanks a lot Radha!